16 February 2016, at 6:00a.m. Avian influenza (AI) is without a doubt one of the biggest concerns for the world’s poultry industry, writes Melanie Epp. It's possible for wild bird species to be infected with a high pathogenic H5 virus without showing any signs at all. Each and every year, new outbreaks occur in most regions of the world, and according to Dr Arjan Stegeman of Utrecht University in The Netherlands, it’s a problem that is not going to get better. In fact, it’s only going to get worse. Dr Stegeman was a keynote speaker at the International Egg Commission’s Global Leadership Conference in Berlin last September. 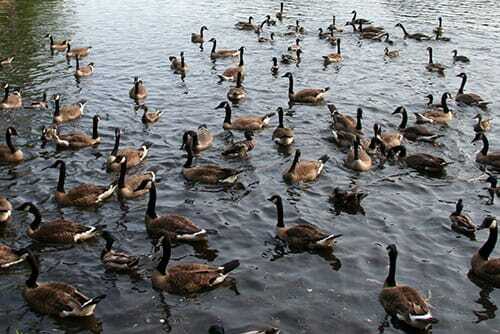 AI is an infectious viral disease that occurs in birds, particularly in wild waterfowl, such as geese and ducks. AI viruses can be sub-divided into two groups, high pathogenic and low pathogenic AI. This division is based on their ability to cause infection in poultry. Low pathogenic viruses can cause mild symptoms, like gut trouble. High pathogenic viruses, on the other hand, result in high mortality rates, sometimes up to 100 percent in just 48 hours. While avian influenza ranges from H1–H17 types, only H5 and H7 are highly pathogenic. Note, too, that highly pathogenic viruses are always categorised as either H5 or H7, but not all H5 or H7 viruses are highly pathogenic. Genetically speaking, H5 and H7 viruses are actually quite similar, though, Dr Stegeman explained in his talk. Even more problematic is the fact that high pathogenic viruses can arise from low pathogenic ones. Why this happens is not fully understood. Another peculiar feature of this virus is that it can easily exchange genetic material. “If a duck gets infected by the H5N1 virus, and at the same time an N8 virus, a new virus can arise [H5N8],” explained Dr Stegeman. “This happened, for example, with the H5N2 virus that arose in the United States,” Dr Stegeman continued. While high pathogenic viruses wreak the most havoc on poultry farms, they’re the quickest to be diagnosed by the farmer. Transmission, on the other hand, is pretty much the same as it is with the low pathogenic viruses. The only difference is that concentration of the virus is much higher in high pathogenic types. In the past 10–15 years, there have been a number of interesting occurrences in highly pathogenic AI. For one, the scientific literature before 2003 showed that epidemics of new sub-types (H5N1 or H7N7) always arose from the introduction of a new low-path virus, which then mutated to a high path virus. This still happens today; only now, wild birds have entered the equation. The hypothesis, explained Dr Stegeman, is that the H5N1 epidemic was not effectively controlled in some countries, and spillover of the virus to wild birds occurred. Experts agree that H5N1 was the first high pathogenic AI to be widely spread through the movement of wild birds. Today, it is even possible for several wild bird species to be infected with a high pathogenic H5 virus without showing any signs at all. In April of 2015, what has since been described as the worst animal disease outbreak in the history of the US began. On April 12, the first birds tested positive for high pathogenic AI on a 200,000-bird, cage-free operation in Wisconsin. On April 20, a 5-million bird operation in Iowa was hit. “From April 20 until the middle of June, it was absolutely crazy,” Chad Gregory, United Egg Producers, told the crowd in Berlin. The US turkey industry lost almost 8 million turkeys. Ultimately, the outbreak ended up wiping out some 35 million egg-laying hens, representing 12 percent of the entire US flock, and another 5–6 million pullets. The US turkey industry lost almost 8 million turkeys. In total, 223 premises tested positive. But what made the US situation so much different than the European cases? Dr Klaus-Peter Behr of AniCon in Germany explained. The H5N8 virus that hit both Europe and North America originated in Southeast Asia. This was transferred via migrating birds from Russia to Europe, and from Alaska and Canada to several US states. On its way to the US, though, the H5N8 virus mixed with an H9N2 virus and mutated into the H5N2 virus that hit the US poultry industry. While the original H5N8 virus needed only two days from infection to mortality, the new virus had an incubation period of 8–10 days. “This difference gave the US virus a whole additional week to intensively multiply and spread without being obviously present, as shown by increased mortality,” said Dr Behr. In Europe, poultry producers had a tremendous advantage, since the virus became obvious very quickly after introduction on the farm. “This was the crucial difference that made it possible to stop spreading of the virus one week earlier than in the US cases,” concluded Dr Behr. Most experts agree; AI isn’t going anywhere. That’s not to say, though, that producers are helpless.